The terms ‘finish’ and ‘finishing process’ have a particular meaning when applied to woodwork and refer to the way in which surfaces are treated. This is usually by the application of a liquid coating material which dries by evaporation of solvents and/or oxidisation of the vehicle in which the constituents are suspended. Reasons for applying a finish are many. They include: preventing decay, as in fencing; protecting the woodwork from the elements; introducing bright and attractive colours; protecting the wood surface from wear and abrasion, chemical attack and so on; and enhancing the natural beauty of the wood, which is the aim of a cabinet maker. Finishes also protect the wood surface from dirt, spillages and many other hazards in the domestic and commercial spheres. Where mixed species of wood have been used on a single project the finish selected may be to highlight the colour differences, or to try to bring the mixed woods to a uniform shade. Preparation for finishing, known as ‘cleaning up’, has been described previously but it will vary according to the nature of the job and the type of finish to be applied. At one extreme, timber that has to be creosoted will not require any preparation other than ensuring that it is reasonably dry. At the other end of the scale a finely made piece of furniture will require very careful and thorough cleaning up as a preparation for applying the finish, with or without staining. Finishes for woodwork come under two main categories: opaque and clear. Paints of various kinds provide the main types of opaque finishes, which include oil, vinyl, emulsion, cellulose-based and enamels. Generally the type of paint is determined by the liquid vehicle, or solvent used in the manufacture. Clear finishes include wax, oil, shellac, white french polish, varnish, clear cellulose and modern ‘plastic’ finishes. It should be understood that while paints have an obliterating effect they do not make up for poor work or shoddy materials. The quality of a painted finish depends partly on the paint itself, and to a much greater extent on the surface to which it is applied. A poorly cleaned up or ill-prepared surface will show through the best of paint. Small blemishes, if carefully filled, stopped and levelled off, properly treated knots and other minor faults, nail and screw holes, can become undetectable under a carefully applied paint. If a clear finish is required, whether stain will be used or not, then the surface needs even more preparation. A commonly held belief is that any form of finish covers up faults in materials or workmanship. Not only is this wrong but the opposite is actually true. Clear finishes have the effect of highlighting.and magnifying defects. The slightest of ridges, which insufficient glass-papering has failed to remove, may be difficult to spot before finishing but can become very noticeable afterwards. By then it is too late to do anything about it. Preparation for the finish, following the cleaning up process described in an earlier section, includes stopping, filling and staining. Stopping means filling cracks, holes and indentations with a plastic material which dries fairly quickly and adheres firmly. There are many preparations available in powder or paste form. The powders are mixed with water, and pastes are applied as they are supplied. Ideally the stopper should have the same density and porosity when dry as the surface being treated. It is an advantage also if it is of the same colour, but this is of less importance with painted finishes. Although used extensively at one time, linseed oil putty is not a good stopper. It is slow drying, eventually shrinks and does not have good adhesion. Plaster of paris expands some time after it has set and causes ‘blowing’. Cellulose type stoppings are inert and have good adhesion. They are quite good for preparing wood that has to be painted, but as they are water-mixed they dry slowly. 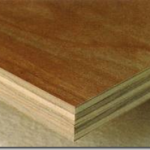 Resin putties are quick drying and special ones for wood are excellent, but not readily available in the domestic market. The author has used powder stopping mixed with resin into a putty-like paste, then added the catalyst or hardener and used the paste as a stopping for exterior woodwork, with excellent results, including rapid setting. Even car body repair resin paste will make a good and quick-drying stopper, although rather expensive, for painted wood that has suffered some damage. For varnishing and polishing, open grain needs to be filled. As with stoppings, many types are available, ready mixed or in powder form. Grain fillers are rubbed in with a damp rag, across the grain. When dry, as with stopping, they are sanded smooth. If required, a further application is made until a satisfactory surface is achieved. The filler should be near enough the colour of the wood, but light coloured fillers can often be toned down with water-based stains such as Furniglas, even if the woodwork itself is going to be stained during the next stage of work. Various tools are used to apply stoppings and fillers – a painter’s broad-knife is useful – but often enough a wood chisel makes a good applicator for dealing with small holes. The materials can also be scraped on with strips of plastics sheet, scraps of plywood, card etc. Quality of tools and materials used for finishing is important. It is always better to play safe and use the products of a reliable manufacturer. This applies particularly to brushes, where the cheaper ‘household’ types should be avoided. When buying, choose a brush which has long bristles, and with a good body of them in the head. The bristles should also have a fair degree of spring in them, especially where oil paints are being used. For shellac polishes and spirit varnishes a softer bristle is to be preferred. Ideally, polisher’s mops should be used. These are circular in shape with soft bristles or hairs, having a rounded or slightly pointed tip. They are available in different sizes, number 8 being a good general purpose size, well suited to home use. The purpose of this is twofold: the hood acts as a cover for the jar in which the polish is contained, and it prevents the bristles from resting on the bottom of the container, where they would soon spread out and become useless. A paint brush distorted in such a manner is said to be ‘crippled’. Signs of a good brush or mop are that the bristles hold together when wet, and keep a good shape. Brushes need some care and attention if their maximum life potential is to be obtained. If they are going to be used again the following day they should be suspended overnight in a container of the appropriate thinners. After final use, wash out in clean thinners, dry out as much as possible with a clean rag then wash thoroughly with soap and hot water. Bristles should then be manipulated to a good shape and lightly tied with a rubber band before leaving to dry out. The author prefers to wrap the head lightly with kitchen tissue as an aid to setting the shape while drying out, and wash out brushes after every session, in thinners. To get rid of excess thinners before re-using the brush, hold the handle between the palms of the hands and ‘swizzle’ the brush vigorously – taking care that the fine spray does not alight on anything vulnerable. Rag is used during many of the finishing processes, apart from drying out brushes. This always should be clean, soft and most important, free from fluff. Sections of washed cotton garments are likely to be the best, but avoid wool. Physical conditions under which finishing is done are important. This is to allow the surface being treated to act as a reflector of the light from one side to the eyes of the person doing the finishing, on the other side. The reflection which the surface gives is a very important guide to the way the work is going. The big enemy of most finishing processes is dust, particularly surfaces which remain tacky for several hours. Draughts must be avoided as far as possible as they create air currents by which particles of dust become mobile. Doors and windows should be kept closed as far as this is reasonably possible to minimise air movement. Finishing is best carried out in a warm atmosphere of around 65° F, but avoid the use of fan heaters for obvious reasons. Most finishes dry better with gentle warmth, and the flow quality usually improves as the temperature is raised, within tolerable limits. Humidity is not good for finishing processes and the air should be reasonably dry. It is often convenient to carry out the finishing process in the afternoon or evening, when work with wet surfaces can be left to dry overnight in a closed room or workshop. With an oil painted finish at least three coats are necessary. Before applying any paint, however, all knots or resin pockets should be coated with ‘knotting’. Resin can exude through several coats of paint, and prevent some paints from drying properly. Knotting is a kind of thick, shellac varnish which dries quickly and seals in the resin. It should be feathered off at the edges so as not to cause ridges which will show under the paint. The first coat of paint applied to new woodwork is referred to as the primer. Primers can be white, grey or pink in colour but their common quality is the ability to penetrate deeply into the wood fibres, adhere firmly and provide a solid base for subsequent rubbing down and following coats. Aluminium primers for wood are becoming increasingly popular. It is claimed that they are more effective in sealing knots than the traditional material, and the author’s experience confirms this. They should be well stirred before use, and frequently during use. Standard primer can be thinned with white spirit to increase its penetrative powers in hard, dense wood or to seal off very absorbent surfaces. 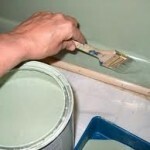 If this is done it may be necessary to apply another coat, to provide the body required for rubbing down. Primers, nonetheless, should be well brushed out and not applied thickly. If your primer does not brush out easily, thin it slightly with the recommended thinners. The next coat is the undercoating, usually of a similar shade to the finishing one, but not invariably. This also provides body and a good, opaque base for the top coating. Two undercoats are even better but each one must be lightly rubbed down when dry. The topcoat, gloss, satin or matt, provides protection to the undercoatings. It is a thin, tough but elastic film which will withstand dirt, many harmful vapours and the elements, and with some makes is slightly translucent to allow the colour of the undercoating to blend with it. Some paint makers advise two top coats for finest results. Satin is usually used indoors, matt invariably so. A coat of oil paint should be left for at least 12 hours before follow-on treatment, although it may be touch dry before that time has elapsed. On the other hand, do not leave the following coat until the film has hardened. A dry surface and a hard one can be very different. Paint usually dries overnight but may take several days to harden. A fresh film will bond to the dry one but not so readily to it when it has hardened off. Many modern paints are designed to short circuit the techniques described for oil paint with linseed or other vegetable oil as the vehicle and white spirit for the solvent. Oil paints are returning to favour because of the faults inherent with these modern paints. Craftsmen who make reproduction painted furniture would not use synthetic finishes. Light rubbing down with fine abrasive should be carried out between one coat of paint and the next. This is known as ‘flatting’. The purpose is to level the surface and free it from brush marks, runs and dust pimples, and provide a good ‘key’ for the next coat. Coarse paper will make scratches on the surface, which will show through the final coat, and may cut the ground back to bare wood. For very hard paint films and enamels wet-and-dry abrasive can be used, lubricated with water. Do not use this on bare wood. After flatting, the surface must be dry and well dusted before another coat is applied. Paint should be applied relatively thinly. Never overload the brush as this results in runs and messy dripping. The brush is not used merely to apply the paint but to spread it out thoroughly and evenly. Brush tips are used with progressively lighter strokes as the paint is spread out from each brush-load. Only about two-thirds of the brush should be dipped in the paint and tips are then lightly wiped on the container edge to remove excess charge. Each part of the surface should be brushed over several times, alternating across and with the grain. This is called ‘crossing’ and helps to ensure even coverage, and the avoidance of thick build-ups which can lead to runs and wrinkled drying. When a specific area has been evenly coated a final light brushing, along the grain and with only the brush tips, should be given. Work away from the edge, starting some distance in from it, as arrowed in the drawing. The brush should have lost most of its charge when it sweeps the opposite edge and the tip should be lifted so the bristles leave the work gently as it reaches the edge. End grain must be treated with care. It is very absorbent and will come up much darker than faces of the timber if the same quantity of stain is used. It may be a good plan to seal end grain before staining, with some well diluted finishing material. Then use diluted stain in one or more coats, as required. Surfaces, also, may be patchy with areas of ‘woolly’, interlocked, reversed or soft grain. Areas such as these may take up more stain than the rest, or it may go in more deeply, causing dark patches. Filling may have reduced the risk but a weak sealer coat may be advisable if a stroke with a water-charged brush indicates extra absorbency areas. If darker streaks have to be introduced deliberately in order to match, use artists’ or pencil brushes, after the base coat of stain is dry. When all staining is completed the work must be well rubbed down with the finest grade abrasive, following the grain, and then dusted off until quite clean. Vacuum dusting is best if finishing is to follow in the same room because dust can float around for hours after brushing off. Staining does no more than change the colour of wood. It is not in itself a finish although there is a range of varnish stains which provides a dual role. First treat the panels, then muntins, rails and stiles. This sequence avoids the bad practice of cross-grain brushing where joints occur. At one time varnishes were considered to have relatively poor drying qualities, especially in colder than normal temperatures. They did not like humid conditions and proof of this would be displayed by a grape-like bloom on a varnished surface affected by damp air. Copal, carriage and similar varnishes are still used for high-class work when appearance, durability and weather resistance are the first requirements. Modern synthetic varnishes are much quicker drying than the oil types but can also be temperamental. Polyurethane varnishes are tough, resist abrasion reasonably, are easy to apply when atmospheric conditions are favourable but appear to lack the penetrative power and adhesion, and the solar ray resistance of older types of varnish. This is, of course, a generalisation and these finishes are still being improved upon and fortified in the light of experience and research by the chemists who created them. The polyurethanes generally have a good flow and do not need extensive brushing out. They can withstand temperatures up to that of boiling water, many acids and alcohol mixtures. At least two coats of varnish are needed and up to four, depending on the nature of the wood and the particular type of finish required. As with paint, the first coat should be diluted for extra penetration, but always follow the maker’s instructions in this respect. All coats except the final one should be lightly rubbed down and dusted before the next. Some woods, particularly the softer ones, are more absorbent than others and in consequence require an extra coat. Modern varnishes are available in three distinct types, drying out according to the particular texture required for the finished surface. They are gloss, eggshell and matt finish. The first provides a high gloss, accentuated by the quality of preparation, and easy to clean surface. The eggshell finish leaves a pleasing satiny sheen which is nowadays very popular and the third provides a well-bodied surface without gloss or sheen. It is not suitable for outdoor use or in situations where a lot of dirt is produced, as this clings to the matt surface and can be difficult to remove. When an eggshell or matt finish is required the undercoating should be glossy; with a gloss finish the opposite is the case. Do not apply a finishing coat directly to the wood surface – it will simply sink in, unevenly, and provide a blotchy base for following coats. Some modern finishes, however, can be applied coat-on-coat and are claimed to provide a one-coat finish. But, they have limitations not immediately apparent yet obvious to anyone who can appreciate a first-class job. Some manufacturers offer a range of ‘coloured’ varnishes. The colours are of two broad varieties, one being the shades of traditionally treated furniture woods: dark oak, rich mahogany, teak, and so on. The idea is to combine the purpose of a stain with a varnish and thus colour pale or cheaper wood to imitate the more expensive kind. Such varnishes have their place and are useful, in particular when on restoration work of a domestic nature. They must be applied carefully from the point of the brush to obtain an even flow, as uneven coating will result in patchiness. Each coat applied will make the surface darker so, when the required colour is obtained and a further coat is needed to build up body or gloss, a compatible clear varnish should be used. The other type of coloured varnish is pigmented by the addition of bright dyes in basic colours: orange, green, yellow and many others. They act rather like translucent paint, giving a bold colour to the work but allowing the grain to show through. They are useful on kitchen projects and for nursery furniture or toys. Spirit varnish offers a quick-drying alternative to oil varnish and is particularly suitable for small jobs. It is made from shellac with the addition of a gum such as sandarac, dissolved in industrial alcohol. Methylated spirit is a thinner or solvent. Because alcohol evaporates rapidly, especially in a warm atmosphere, spirit varnish dries quickly. As a result, several coats can be applied in the time it would take one coat of oil varnish to dry and the freshly applied surface remains tacky for a short while only. It is therefore less likely to be affected by dust in the atmosphere. The varnish must be applied evenly and quickly, with particular attention to brushing out as it does not flow out so readily as oil varnish. 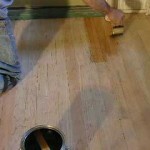 Rubbing down between coats is essential or the final surface will be very uneven. French polish is also shellac and alcohol formulated. Traditional french polishing requires a fair degree of skill on the operative’s part and the technique of this process is outside the scope of this post. French polishing can, however, be done in a simplified way, with satisfactory results for the amount of time and skill involved. Between three and six coats of polish should be applied, thinly and evenly – preferably using a polishers’ mop. Rubbing down between coats is an essential part of this process but, as the film of polish is very thin, flatting must be done with the finest grade of abrasive paper: 00 or ‘flour’. If a high shine is required the last coat can be left as applied by the mop. Alternatively the final coat can be flatted like the others and then waxed. A good quality furniture wax will do, applied rather thinly and well rubbed in. The surface is finally burnished with a clean, soft duster. Some workers prefer to apply the wax with very fine steel wool, which further abrades the shellac and therefore continues to level out the surface. Whatever method is used the final result is a semi-gloss type of finish which is quite popular and pleasant to handle. The waxing can periodically be repeated if the surface needs a tonic and restoration of lustre. The techniques can be modified slightly to leave a matt finish. Coating is continued, as before, to build up what is called a ‘body’ and the final, dry coat is rubbed down with fine steel wool, used dry. Rubbing must be with the grain or very fine scratches made by the wool will be visible. Most shellac polishes and varnishes are orange-brown in colour, depending on the particular type of shellac used. This includes orange, button and garnet. They all have a slight darkening effect on the wood but if the wood is very dark in colour this is insignificant. Problems arise with light coloured or mixed woods, where the work would be spoilt using a polish of this type — as, for example, in inlaying or marquetry work. 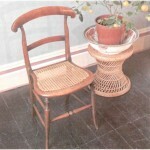 For any job where the colour of the wood is to be retained as natural as possible, white french polish should be used. White polish is made from orange shellac which has been bleached. Shellac finishes are only suitable for indoor use as they rapidly break down if exposed to the elements. They also mark very easily, particularly from heat and water, and spillage from alcoholic drinks can ruin the surface. Wax polishing is a fairly simple process and is one of the oldest methods of finishing woodwork. It is considered especially suitable for oak, leaving as it does a surface with a very mellow ‘feel’. Because waxing has only limited qualities of adequately filling the grain, there is a danger that a wholly waxed finish will, after a period of time, tend to pick up a certain amount of dirt. Waxing is therefore not particularly suitable for light coloured woods, and when used now with oak this is usually when the wood has been stained, often quite dark, to simulate an antique finish. In order to seal off any staining from the effects wax may have and also to act as a foundation and help keep out the dirt, it is common practice with this form of finish to give one or two coats of french polish over the stain, before waxing. An effective way of applying wax polish is by using a small brush, such as a shoe brush. The wax should be brushed on thoroughly and liberally then left for several hours to harden off. Next, as with shoe polishing, another brush is used to bring up the shine and a soft duster for final burnishing. Wax polish can quite easily be made at home. The principal ingredients are pure beeswax, a little carnauba wax, and pure terpentine. The wax is shredded into a shallow tin, covered with turpentine and left until the wax disolves. Final consistency should be like soft butter. Slight variations of the above recipe exclude the carnauba wax, which is exceedingly hard, or involve addition of other substances and heating to speed up the process. Turpentine, however, has a low flash point and great care is needed. Waxing is the sort of finish which improves with the passage of time, providing periodic re-waxing and the all-important burnishing operations are carried out. Oiling the wood as a means of finishing has seen a revival of popularity in recent years. This is probably because of the preference for a natural finish with minimal shine, which is the effect given by oils. It is also quite suitable for teak — an oily wood – and veneered chipboard constructions with their large plain surfaces. Traditionally linseed oil, which slowly oxidises when exposed to the air, was used but it is slow to dry and picks up dirt easily. 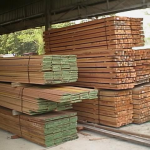 Modern oil preparations are usually sold under the name of ‘teak oil’, but they can be used on almost any timber. Application is simple: the oil is wiped on generously with a cloth, rubbed well in and the surplus then mopped off. After leaving for several hours a second application is given. Oiling has only very slight grain filling qualities and is more suited to darker coloured woods because of dirt-retaining properties. As with waxing, it can be re-done at intervals and the body of the finish builds up in a similar manner. Plastic lacquers offer a modern way of finishing home-built furniture projects. Most set by a chemical reaction brought about by the addition of a catalyst or hardener. Only enough for the job in hand is prepared because once the catalyst is added the action is irreversible. Coatings can be generous and they flow out evenly. Setting is entirely by chemical action, not evaporation or oxidisation, so the process is quite rapid. Thorough flatting between coats will result in a beautiful surface finish, and wet-or-dry papers are required for best results, using water or white spirit as a lubricant. Flatted surfaces must, of course, be well, cleaned off and quite dry before following coatings are applied. Use grade 400 or 500 to avoid scratching and continue until all traces of shine are removed from the surface, which must be free from ridges or hollows. The final lustre is obtained by use of a burnishing cream and the shine will be in proportion to the amount of rubbing which the surface receives. A power drill fitted with a polishing bonnet can speed up the burnishing work considerably. As these lacquers are so hard a very high shine can be produced by burnishing. This is known as a ‘mirror-finish’. It can also be waxed to a satin sheen or left matt, as in the waxing process previously described. Because this type of lacquer requires a fairly thick film, built up from relatively liberal coatings, the polish is at its best when applied to flat, horizontal surfaces. It is therefore ideal for table tops, especially as it is highly resistant to scratching and marking from heat and liquids. Some, in fact, will resist the heat of a smouldering cigarette. For certain kinds of toys and nursery projects, decorators’ emulsion paints offer a cheap and simple way of providing a finish. White emulsion can also be used as a primer/sealer for hardboard which has to be painted. Emulsions have the advantage of being quick drying and they have good covering properties. For most jobs two coats are sufficient, but to protect the surface from finger marks one or two coats of clear varnish can subsequently be applied. Sometimes wood is given a finishing treatment more to protect it from decay than anything else. By far the most common treatment is creosote. It is still a popular way of protecting garden fencing, sheds, greenhouses and similar outbuildings. At its simplest creosote is just brushed on, the more coats the better. The treatment is renewed every two or three years. For fencing posts and any timber in contact with the ground a better process is to immerse the lower part in a container of creosote for several days, or even weeks. Timber should be well seasoned as the drier it is the more it will absorb the fluid. Creosote has also a decorative effect as it stains the wood brown. It is available in light or dark shades. Once wood has been treated with creosote it cannot be painted as the ‘tar’ will eventually bleed through the paint, even though it appears to be dry and fit for painting. Where it is desired to give a painted finish combined with a decay inhibitor, then one of the proprietory solutions, such as Cuprinol clear should be used. It is applied in the same way as creosote. So much for finishing. We have only touched the fringe of the subject but hope the object of this post has been achieved. Your woodworking project, whether it be a fencing post or a reproduction piece of furniture, will ultimately be only as good as the finish applied.